The strip steak, also called a New York or a Kansas City strip, is considered among the higher-end cuts of beef, along with the filet mignon, the rib-eye, and the porterhouse or T-bone steak. The strip steak comes from the beef short loin subprimal, and it starts off with a short loin that has had the tenderloin removed, to produce a bone-in strip loin. The bone in question is the backbone (specifically the thoracic vertebrae), which is usually removed to produce a boneless strip loin. But it's the muscle in the meat that determines how flavorful and palatable a steak will be. The primary muscle in the strip loin is the longissimus dorsi, which also happens to be the main muscle in a rib-eye steak. It extends from the hip bone all the way up to the shoulder blade, and it's a very tender muscle. Since they're generally a single muscle, strip steaks don't have much connective tissue or fat, both of which are mainly found between muscles. But they do have a good amount of intramuscular fat, or marbling, which adds flavor and moisture to a steak. 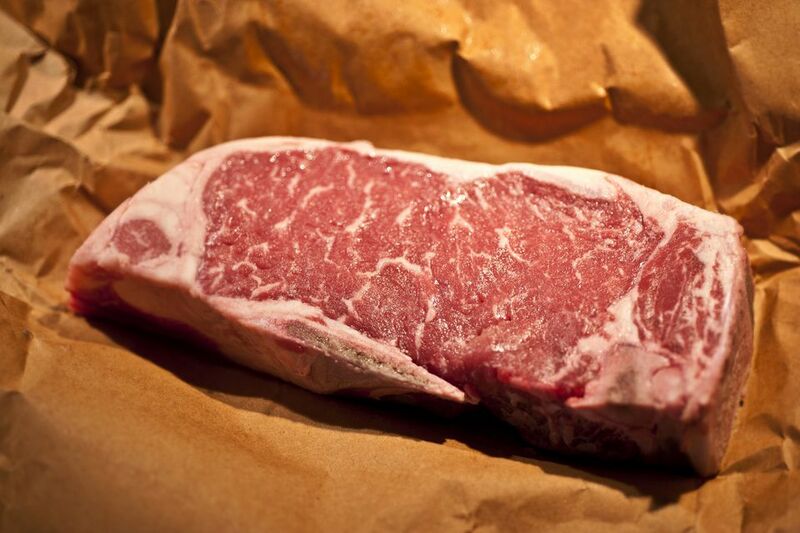 In fact, the degree of marbling is one of the main characteristics used to assign quality grades to meat. More marbling generally means higher quality. In the case of a strip steak, it puts it among the more expensive cuts of beef. Two other muscles might appear in a strip steak, depending on the butcher: the multifidus dorsi and the gluteus medius. The multifidus is a tender muscle, and if it's present, it will be up at the top (the wide end) of the strip steak. Some butchers trim them off the strip loin, but it's still a good piece of meat. You don't want the gluteus medius in your strip steak, however. It's the sirloin muscle, and you'll only see it in the last two strip steaks that come from the very end of the short loin. The gluteus muscle is tougher than the strip loin, and the vein running through it is quite chewy. Strip steaks are easy to cook on the grill, under the broiler, or in a cast-iron skillet on the stovetop. You can also sear them in a skillet and then transfer it to a preheated 425 F oven to finish cooking. Let the steaks come to room temperature on the counter for at least 30 minutes before you cook them so they cook evenly. Pat them dry with paper towels so you can get a good sear quickly. And don't be afraid to use some butter with this leaner cut. What Does Strip Steak Taste Like? A cut favored for its beefy flavor, strip steaks are usually boneless, but the bone-in version is sometimes called a shell steak or club steak. The bone adds flavor and moisture, in addition to making the steak more impressive-looking, which is why you often see them served in steakhouses and fine restaurants. If you left the tenderloin in, you'd have T-bone or porterhouse steaks, rather than strip steaks. For comparison, consider the T-bone or the larger porterhouse steaks, both of which are made up of a strip steak and a tenderloin steak, each with its own cooking time. That makes cooking a T-bone or a porterhouse to a uniform degree of doneness difficult. But strip steaks are easy to cook and don't need a lot of fussy preparation to taste great. Whether you buy strip steaks pre-packaged at the grocery store or freshly cut from a butcher, look for the ones cut from the rib end or the center of the strip loin. It's easy to tell the difference by looking at the shape of the steak. Look for a cut that's wide and relatively straight, without much difference in width from top to bottom. The fat around the edge should be trimmed to about 1/8 of an inch all the way around. Avoid steaks that are kind of wavy, or shaped like a question mark, or have one end that is substantially more narrow than the other. These are from closer to the sirloin end and less desirable. Indeed, you might even see something called a "center-cut" strip steak, which sounds like it must be from the center. But all it means is that it can't be the last one from the sirloin end. The worst you can get with a center-cut strip steak is one that has a small piece of the gluteus medius, but it won't be visible on both sides of the steak. Like with most good steaks, keep the preparation and cooking of a strip steak simple so the flavor of the meat shines through. Store uncooked strip steak wrapped and in the refrigerator for up to three days. To freeze uncooked steaks, wrap each one individually in plastic wrap, making sure to seal them tightly with no air bubbles. Put them in a large plastic freezer storage bag or airtight container before you put them in the freezer, and use them within three months for the best flavor and texture. Strip steak packs a wallop of protein along with good doses of the B vitamins, zinc, and selenium. A 3-ounce serving contains 160 to 180 calories, depending on the amount of fat in the cut, and 25 grams of protein; keep in mind, however, that most strip steaks weigh between 10 ounces and a full pound. With an average of 4 grams of fat per ounce, you consume substantially more, a lot of it saturated, than a healthy diet allows when you eat an entire steak.